Having graduated with honours from University College Cork in 1999, Dervla went to work in the UK gaining valuable experience in general dentistry. 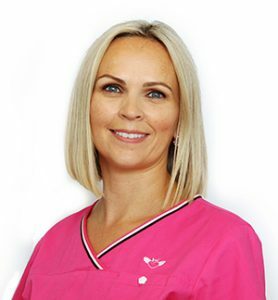 After returning to Ireland she established Leavy Dental Care in Ballincollig in 2004. She is a member of the Irish Dental Association and regularly attends educational meetings and hands on courses. The Botulinum toxin injections are intended to make lines and wrinkles less obvious, while also relaxing facial muscles. Your face will be cleaned before the botox treatment takes place. Small amounts of Botulinum toxin are then injected into the skin at different areas. It can take three to five days for the surgery to have an effect, and up to two weeks for the treatment to take full effect. It is very important that these treatments are only carried out by medical professionals. Dermal Filler treatments are aimed at filling out wrinkles and creases in the skin. They are also used to increase the volume of the lips. The treatment involves small injections into the skin and the area is then massaged. The treatment can range between 30 minutes and one hour. As you may experience some swelling after the treatment, it is advisable to avoid hot drinks, alcohol and the sun. It is strongly recommended that Dermal Filler treatment is carried out by a medical professional.